The Vault on Merchant Street is a purpose built theatre in the vaulted basement of Augustine United Church in Edinburgh's Old Town. The 42 seat space utilises the existing architecture to create an intimate proscenium stage on the flat floor with a raked audience. We want to provide this amazing space for hire to individuals and organisations in the Edinburgh area for a wide range of performance, networking and presentation events. 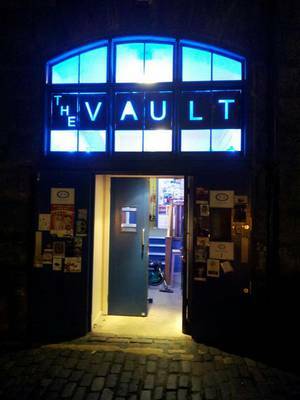 The Vault is already a hub of performance each August as Venue 29 in the Edinburgh Fringe. If you are interested in bringing a show to the Vault during the Fringe please look at our Fringe website. If you are interested in the Augustine United Church spaces The Sanctuary or The Studio outside of the Fringe please visit the Augustine United Church website. Paradise Green Promotions is a Company Limited by Guarantee. Registered in England, No 03348572. Registered Office: 33 Burnage Hall Road, Manchester, M19 2LD. Paradise Green Promotions is not registered for VAT, as most of our trading is VAT-exempt.